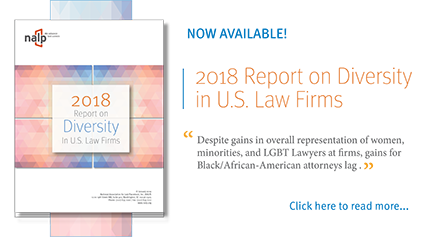 Women and Minorities at Law Firms - Additional Findings for 2017 (NALP Bulletin, May 2018) — When it comes to law firm diversity, reporting national averages can mask what are in fact huge variations in representation between individual firms as well as between firms of different sizes. Women and Minorities at Law Firms — What Has Changed and What Has Not in the Past 25 Years (NALP Bulletin, February 2018) — NALP's reporting on the presence of women and minorities in large firms now spans 25 years. Findings have been reported out year by year over that time period, but summary findings are presented here all together for the first time. Race/Ethnicity and the Geographic Distribution of Law Firm Jobs Taken by New Graduates — Class of 2015 (NALP Bulletin, November 2016) — Among law school graduates taking jobs in private practice, minorities are more likely than their non-minority peers to take that job in one of the 21 largest law firm employment markets for new graduates. Women and Minorities Maintain Representation Among Equity Partners, Broad Disparities Remain (NALP Bulletin, March 2016) — Equity partners in multi-tier law firms continue to be disproportionately white men. New figures from NALP show that in 2015, only 17.4% of equity partners were women and only 5.6% were racial/ethnic minorities. Women and Minorities at Law Firms by Race and Ethnicity - New Findings for 2015 (NALP Bulletin, January 2016) — In a November 19, 2015 press release, NALP reported that women and minority partners continued to make small gains in their representation among law firm partners as a whole in 2015, and that the percentage of minority associates has inched up every year since 2011, after falling in 2010 in the wake of the recession. However, the percentage of women associates has decreased in all but one of the last six years and now is almost one full percentage point lower than in 2009. Women, Black/African-American Associates Lose Ground at Major U.S. Law Firms (November 19, 2015 Press Release) — Women and Black/African-Americans show declines in representation at major U.S. law firms, according to the latest law firm demographic findings from NALP. Although women and minorities continue to make small gains in their representation among law firm partners in 2015, the overall percentage of women associates has decreased over the majority of the last five years, and the percentage of African-American associates has declined each year since 2009. Women and Minorities at Law Firms by Race and Ethnicity - An Update (NALP Bulletin, May 2015) — In a February 17, 2015 press release, NALP reported that women and minority partners continued to make small gains in their representation among law firm partners as a whole in 2014, and that the percentage of minority associates has rebounded for the fourth year in a row after falling in the wake of the recession. Although the percentage of women associates increased a bit after eroding from 2010 to 2013, it has yet to go above the 45% mark reached in 2009-2012. Aggregate statistics about the representation of women and minority attorneys at law firms do not tell the whole story, however. 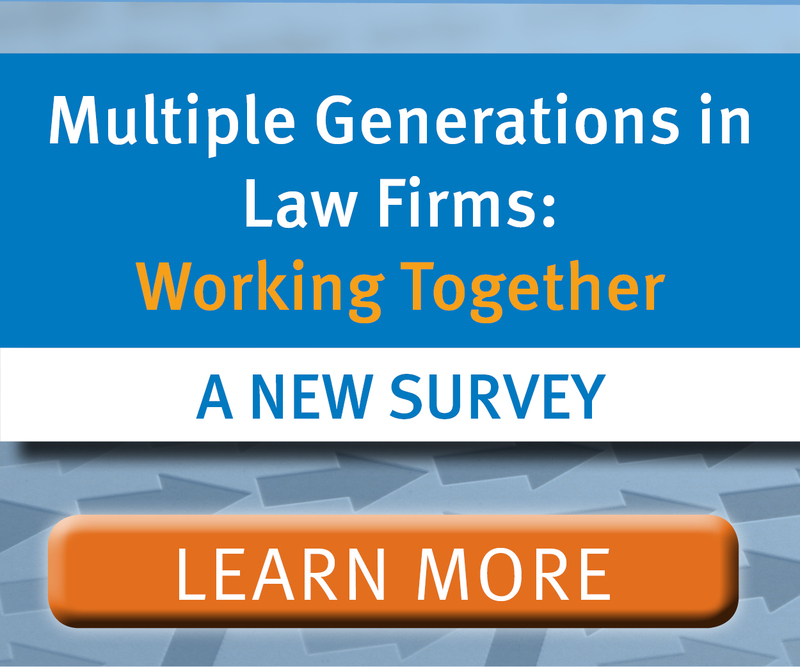 Diversity Numbers at Law Firms Eke Out Small Gains - Numbers for Women Associates Edge Up After Four Years of Decline (February 17, 2015 Press Release) — According to the latest law firm demographic findings from NALP, women and minority partners continued to make small gains in their representation among law firm partners as a whole in 2014, and the percentage of minority associates has gone up for the fourth year in a row after falling in 2010 in the wake of the recession. Although the percentage of women associates increased a bit after eroding from 2010 to 2013, it has yet to go above the 45% mark reached in 2009-2012. Increasing Diversity of Law School Graduates Not Reflected Among Judicial Clerks (NALP Bulletin, September 2014) — Even as the percentage of minority graduates overall has increased from about 14% in 1993 to over 25% in 2013, minority representation among judicial clerks has not shown similar growth. Perspectives on Diversity (NALP Bulletin, June 2014) — Recent NALP research has shown that, while overall representation of minorities among associates at large firms has more than recovered since sliding in 2010, the representation of African-Americans/Blacks specifically has in contrast declined every year since 2010. Women and Minorities at Law Firms by Race and Ethnicity — An Update (NALP Bulletin, February 2014) — In a December 11, 2013 press release, NALP reported that women and minority partners continued to make small gains in their representation among law firm partners as a whole in 2013, and that the percentage of minority associates has rebounded for the third year in a row after falling in the wake of the recession. However, the percentage of women associates has eroded every year since 2010. Representation of Women Associates Falls for Fourth Straight Year as Minority Associates Continue to Make Gains — Women and Minority Partners Continue to Make Small Gains (December 11, 2013 Press Release) — According to the latest law firm demographic findings from NALP, women and minority partners continued to make small gains in their representation among law firm partners as a whole in 2013, and the percentage of minority associates has rebounded for the third year in a row after falling in the wake of the recession. However, the percentage of women associates has eroded every year since 2010. The net result is very small net gains in the representation of women and minority lawyers overall. Race/Ethnicity and the Geographic Distribution of Law Firm Jobs Taken by the Class of 2012 (NALP Bulletin, September 2013) — Among law school graduates taking jobs in private practice, minorities are more likely than their non-minority peers to take that job in one of the 20 largest employment markets for new graduates. Women and Minorities at Law Firms by Race and Ethnicity — An Update (NALP Bulletin, April 2013) — While the representation of minorities continued to inch up, the overall representation of women increased by only a very small amount, and, among associates specifically, representation of women declined a bit again for the third year in a row. Aggregate statistics about the representation of women and minority lawyers at law firms do not tell the whole story, however. Representation of Women Among Associates Continues to Fall, Even as Minority Associates Make Gains (December 13, 2012 press release) — While women and minority partners continue to mark small gains in their representation among law firm partners as a whole, and while the percentage of minority associates has rebounded after falling in the wake of the recession, the percentage of women associates continues to fall compared to their male counterparts. Women and Minorities in Law Firms — By Race and Ethnicity (NALP Bulletin, January 2012) — In a November 3, 2011, press release, NALP reported that by 2011 law firms had made up for some, but not all, of the decreases in diversity figures occurring between 2009 and 2010. While the representation of minorities as a whole among associates increased in 2011 after sliding in 2010, representation of women among associates declined a bit again for the second year in a row. Aggregate statistics about the representation of women and minority lawyers at law firms do not tell the whole story, however. Law Firm Diversity Wobbles: Minority Numbers Bounce Back While Women Associates Extend Two-Year Decline (November 3, 2011 Press Release) — The latest NALP findings on law firm demographics reveal that law firms have made up some but not all of the lost ground after diversity figures fell in 2010. While the representation of minorities increased, more than making up for the decrease from 2009 to 2010, the overall representation of women declined slightly further in 2011 compared with 2010. The Demographics of Equity (NALP Bulletin, November 2011) — For the first time, in 2011 NALP included reporting of equity and non-equity partner information in the NALP Directory of Legal Employers. Many firms with multi-tier partnership structures reported on the demographics of their equity and non-equity partners, and, as a result, we are now able to say something about the disparities that do or do not exist. A Closer Look at NALP Findings on Women and Minorities in Law Firms by Race and Ethnicity (NALP Bulletin, January 2011) — The recent drop in the representation of women and minorities was quite small and occurred only among associates, not partners, but the decrease is still of significance because it represents the reversal of what had been, up until 2010, a constant upward trend. Aggregate statistics about the representation of women and minority lawyers at law firms do not tell the whole story, however. Law Firm Diversity Among Associates Erodes in 2010 (November 4, 2010 Press Release) — The latest NALP findings on law firm demographics reveal that the overall representation of women and minority lawyers in law firms declined between 2009 and 2010. A Demographic Profile of Judicial Clerks — Patterns of Disproportionality (NALP Bulletin, November 2010) — That is to say, judicial clerkships have always been obtained disproportionately when measured by race and gender, though the patterns have not necessarily been obvious. Over the last ten years the overall number of judicial clerkships obtained by law school graduates has decreased significantly, and over this same time, the proportional demographic representation of those obtaining clerkships has shifted. Why Is Nobody Talking About Gender Diversity in Public Interest Law? (PDF, NALP Bulletin, June 2010) — The fact that women outnumber men at least two to one in these fields — which are some of the lowest-earning fields in the legal profession — must spark an important discussion of how these jobs are valued and of both why women are disproportionately drawn to them as well as why men avoid them. Women and Minorities in Law Firms by Race and Ethnicity (NALP Bulletin, January 2010) — Among all employers listed in the 2009-2010 NALP Directory of Legal Employers just over 6% of partners were minorities and 1.88% of partners were minority women, and yet many offices report no minority partners at all. In addition, the representation of minorities by specific race and ethnicity varies considerably by size of law firm and geography. Law Firm Diversity Demographics Show Little Change, Despite Economic Downturn (October 21, 2009 Press Release) — In 2009, the percentage of women and minority lawyers in law firms across the nation was only slightly higher than in 2008, with rates of change in some cases less than in previous years. Representation in some cities showed small gains, while in other markets the percentage of women and minority lawyers actually declined. Throughout most jurisdictions, minority women continue to be the most dramatically underrepresented group at the partnership level. Race/Ethnicity and the Geographic Distribution of Law Firm Jobs Taken by New Graduates - Class of 2008 (NALP Bulletin, October 2009) — Among law school graduates taking jobs in private practice, minorities are somewhat more likely than their non-minority peers to take jobs in one of the 20 largest employment markets for new graduates. However, among racial/ethnic minorities as a whole the figure was 59% compared with 46% among non-minorities. Women and Minorities in Law Firms by Race and Ethnicity (NALP Bulletin, January 2009) — Aggregate statistics about the representation of women and minority attorneys at law firms are widely cited, but these national averages do not tell the whole story. Law Firm Diversity Demographics Slow to Change — Minority Women Remain Particularly Scarce in Law Firm Partnership Ranks (October 10, 2008 Press Release) — Minority women make up less than 2% of partners in the nation's major law firms. At just 1.88% of partners, this group is thus particularly underrepresented in the partnership ranks, even more so than minority men, who account for just 4.21% of partners. Race/Ethnicity and the Geographic Distribution of Law Firm Jobs Taken by New Graduates - Class of 2007 (NALP Bulletin, October 2008) — Of law firm jobs taken by the Class of 2007, just over half (51%), were taken in the 20 cities providing the most jobs to that class. However, racial/ethnic minorities as a whole were more likely to take a law firm job in one of these cities than were non-minorities (58% versus 46%). A Demographic Profile of Judicial Clerks (NALP Bulletin, June 2008) — Even as the percentage of racial/ethnic minority graduates has increased over the last 15 years, minority representation among court clerks, while increasing, continues to lag behind minority representation among all graduates by about 5 percentage points. A Closer Look at Women and Minorities in Law Firms — By Race and Ethnicity (NALP Bulletin, February 2008) — Among law firm employers listed in the 2007-2008 NALP Directory of Legal Employers, 5.40% of partners were minorities and 18.07% of associates were minorities. Just 1.65% of partners were minority women, and just 10.07% of associates were minority women. But these national averages do not tell the whole story. The representation of minorities by specific race and ethnicity varies considerably by size of law firm and geography. Minority Women Still Underrepresented in Law Firm Partnership Ranks — Change in Diversity of Law Firm Leadership Very Slow Overall (November 1, 2007 Press Release) — Minority women constitute just 1.65% of partners in the nation’s major law firms. This group is thus particularly underrepresented in the partnership ranks, even more so than minority men, who account for just 3.74% of partners. These are the most startling findings of NALP’s recent analyses of the 2007-2008 NALP Directory of Legal Employers (NDLE), the annual compendium of legal employer data published by NALP. A Demographic Profile of Judicial Clerks (NALP Bulletin, June 2007 — Even as the percentage of minority graduates has increased substantially over the last 15 years, minority representation among court clerks has not show similar growth. Women and Minorities in Private Practice — Additional Perspectives (NALP Bulletin, February 2007) — Among law firm employers listed in the 2006-2007 NALP Directory of Legal Employers, 5.01% of partners reported for 2006 were minorities, and 16.72% of associates were minorities. Also, because of expanded demographic data collection in the 2006-2007 Directory, we know that just 1.48% of partners were minority women and just 9.16% of associates were minority women. Partnership at Law Firms Elusive for Minority Women — Overall, Women and Minorities Continue to Make Small Gains (November 8, 2006 Press Release) — Minority women constitute just 1.48% of partners in the nation’s major law firms. This group is thus particularly underrepresented in the partnership ranks, even more so than minority men, who account for just 3.53% of partners. These are the most startling findings of NALP’s recent analyses of the 2006-2007 NALP Directory of Legal Employers. Percentage of Women and Minorities at Law Firms Up Slightly for 2006; Only 1.48% of Partners Are Minority Women (NALPnow! October 12, 2006) — Based on 1,524 offices/firms reporting in the 2006 NALP Directory of Legal Employers, women represented 17.90% of partners, and minorities accounted for 5.0%. Employment Patterns — 1982-2004 (NALP Bulletin, June 2006) — NALP's graduate employment data show that, historically, women and minorities are less likely to take jobs in law firms and more likely to take jobs with public sector employers. The table shows the kinds of jobs taken by the Classes of 1982, 1994, and 2004. Women and Attorneys of Color at Law Firms (NALP Bulletin, February 2006) — Law firms represented in the 2005-2006 NALP Directory of Legal Employers (NDLE) collectively reported demographic information on 55,000 partners and more than 60,000 associates, senior attorneys, and staff attorneys. Attorneys of color accounted for 4.63% of partners and 15.62% of associates. The comparable figures for women were 17.29% and 44.12%, respectively. Women and Attorneys of Color Continue to Make Small Gains at Large Law Firms (November 16, 2005 Press Release) — Data from 2005 reveals that attorneys of color account for 4.63% of the partners in the nation's major law firms and that women account for 17.29% of the partners in theses firms. Jobs for New Law Graduates — Trends from 1994-2004 (NALP Bulletin, July 2005) — NALP's employment data for the classes of 1994-2004 reflect changing demographics; however, in some job categories women and minorities continue to be significantly under-represented, while in others women and minorities are over-represented. Women and Attorneys of Color at Law Firms (NALP Bulletin, February 2005) — Law firms represented in the 2004-2005 NALP Directory of Legal Employers (NDLE) collectively reported demographic information on almost 54,000 partners and more than 61,000 associates, senior attorneys, and staff attorneys. Attorneys of color accounted for 4.32% of partners and 15.06% of associates. Women and Attorneys of Color Continue to Make Only Small Gains at Large Law Firms (November 5, 2004 Press Release) — Recent research reveals that attorneys of color account for 4.32% of the partners in the nation's major law firms and that women account for 17.06% of the partners in these firms. Minorities in Private Practice (NALP Bulletin, August 2004) — Looking at the lawyer population as reflected in the NALP Directory of Legal Employers shows that, among partners, African-Americans, Asian/Pacific Islanders, and Hispanics are relatively equally represented. Among associates, however, Asian/Pacific Islanders account for half of minorities. Law Firm Jobs Taken by New Graduates - Distribution by Race/Ethnicity (NALP Bulletin, August 2004) — NALP's employment data for the Class of 2003 show that more than half (57.8%) of employed graduates took jobs in law firms, and, of these jobs, almost half were taken in the 20 cities providing the most jobs to this class. However, among graduates taking jobs in law firms, minorities as a whole, and in particular Asian/Pacific Islander and African-American graduates, were more likely to take a job in one of the these cities. Women and Attorneys of Color at Law Firms (NALP Bulletin, January 2004 — Law firms represented in the 2003-2004 NALP Directory of Legal Employers (NDLE) collectively reported demographic information on 53,000 partners and almost 63,000 associates, senior attorneys, and staff attorneys. Attorneys of color accounted for 4.04% of partners and 14.63% of associates. The comparable figures for women were 16.8% and 43%, respectively. Women and Attorneys of Color Continue to Make Small Gains at Large Law Firms (November 7, 2003 Press Release) — Recent research reveals that attorneys of color account for 4.04% of the partners in the nation's major law firms and that woemn account for 16.81% of the partners in these firms. Employment Patterns — 20-Year Trends (NALP Bulletin, August 2003) — NALP's graduate employment data show that, historically, women and minorities are less likely to take jobs in law firms and more likely to take jobs with public sector employers. The table presents data on jobs taken by the Classes of 1982, 1988, 1994, 2000, and 2002. Demographic Profile of Judicial Clerks (NALP Bulletin, July 2003) — Each year, several thousand law school graduates obtain judicial clerkships. Overall, the percentage of clerkships obtained by Caucasian graduates has decreased by less than five percentage points since 1993. Minorities at Private and Public Sector Employers (NALP Bulletin, April 2003) — Analyses of the 2002 NALP Directory of Legal Employers show that minority attorneys are relatively more common at government and public interest organizations than at law firms. Law Firm Jobs Taken by New Graduates - Distribution by Race/Ethnicity (NALP Bulletin, April 2003) — NALP's employment data for the Class of 2001 show that more than half (57.8%) of employed graduates took jobs in law firms. A comparison of minorities and non-minorities taking law firm jobs reveals that minorities as a whole are more likely to obtain their law firm job in one of the 20 largest cities than are non-minorities. Women and Minorities in Law Firms (NALP Bulletin, February 2003) — Law firms represented in the 2002-2003 NALP Directory of Legal Employers collectively reported demographic information on more than 49,000 partners and over 61,000 associates, senior attorneys, and staff attorneys. Minorities accounted for 3.71% of partners and just over 14% of associates. The comparable figures for women were 16.3% and 42.4%, respectively. Underlying these averages are well over 1,200 individual law offices, with percentages starting at zero and ranging upward. Thus, an additional perspective on the presence of women and minorities is offered by examining how many offices have relatively high representation, some representation, or no representation of women and minorities. Presence of Women and Attorneys of Color in Large Law Firms Continues to Rise Slowly but Steadily (October 3, 2002 Press Release) — Research reveals that attorneys of color account for 3.71% of partners in the nation's major law firms and that women account for 16.30% of the partners in these firms. The presence of women and attorneys of color in large law firms has been rising steadily since 1993 — at that time attorneys of color accounted for 2.55% and women accounted for 12.27% of partners. Jobs for New Law Graduates — Trends from 1991-2001 (NALP Bulletin, August 2002) — ABA data on law school graduates show that, over the past 11 years, women have accounted for between 43% and 47% of law school graduates, and minority representation has increased from about 12% in 1991 to about 20%. NALP's employment data for the Classes of 1991-2001 show that the proportion of women and minorities among employed graduates as a whole reflect these changes. Employment Comparisons and Trends for Men and Women, Minorities and Non-minorities (NALP Bulletin, April 2002) — A look at the graduate employment data over the years shows that, historically, women and minorities are less likely to take jobs in law firms and more likely to take jobs with public sector employers. The table presents data from Employment Report and Salary Survey and Jobs and J.D. 's reports for the Classes of 1982, 1988, 1994, and 2000. Representation of Attorneys of Color at Law Firms Today (NALP Bulletin, January 2002) — Analyses of the 2001 NALP Directory of Legal Employers data show that attorneys of color are relatively more common at government and public interest organizations than at law firms. Attorneys of color accounted for 3.55% of the more than 48,000 partners collectively reported by law firms. Among a far smaller number of public service employers, attorneys of color accounted for 10% of the more than 6,000 supervising attorneys reported. Law Firm Jobs - Where They Are and Who Takes Them — Class of 2000 (NALP Bulletin, July 2001) — NALP’s employment data for the Class of 2000 show that just over half (54.8%) of employed graduates took jobs in law firms. This translates to 17,383 jobs. A comparison of minorities and non-minorities taking law firm jobs reveals that minorities as a whole are more likely to obtain their law firm job in one of the 20 largest cities than are non-minorities. Additional press releases available in Press Releases.